The "farbwerk" is an innovative four channel RGB controller for LED strips. The name derives from the German words "Farbe" (color) and "Werk" (factory/plant/work). Twelve channels in total can be used for up to four RGB strips or as individual channels. Each channel has a resolution of 13 bits (8192 individual steps), resulting in smooth color transitions even at low brightness settings. The farbwerk is an autonomous device with an embedded micro processor and can be operated without a PC. Four sensor inputs can be used with compatible temperature sensors (not included in delivery) to visualize temperatures as colors. 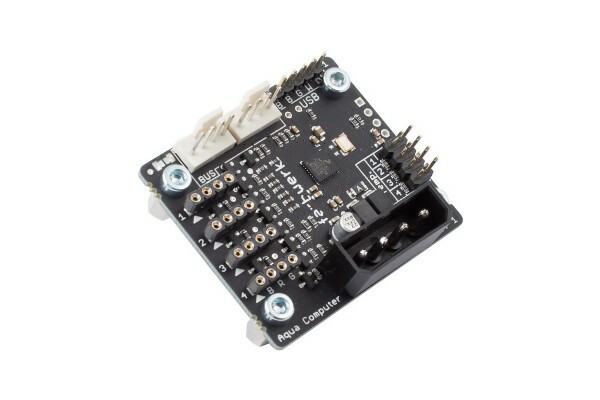 For those creative users interested in elctronics, the sensor inputs can also be used to connect potentiometers or as 0 - 3.3 V inputs - and with a little creativity, the outputs can be used for other applications as well, for example for fans or if used outside the PC, even for devices requiring up to 24 Volts. 1. Direct color selection: Intuitive interface controls of the aquasuite allow a precise selection of the color and adjustments for the intensity and brightness. 2. Adjustable color transitions: The aquasuite can be used to set color transitions which are continuously displayed with an adjustable speed. 3. Effects: A brightness curve can be defined to add a pulsating effect. 4. Control by sensor inputs of the farbwerk: The sensor inputs of the farbwerk can be used to change the color of the assigned channel directly. For example a color transition between 20 °C and 35 °C can be set in the aquasuite and will be processed by the hardware of the farbwerk. 5. Software sensors (e. g. CPU load, network etc. ): Like the aquaero, the farbwerk can be configured to use software sensors. The communication between the aquasuite and the tools HWiNFO, AIDA and Open Hardware Monitor allows to use many different system values to control the channels. For example, the CPU load can be used to automatically adjust the color within a specific range. Since these software sensors can be also accessed via Bluetooth, it would be possible to display them on a smartphone. The farbwerk can be configured using the free of charge "aquasuite" software and an USB connection to the PC. The aquasuite supports an unlimeted number of simultaneously connected farbwerk controllers. The configuration is saved in the farbwerk's microprocessor, so USB can be disconnected after initial setup. In addition to the USB interface, an aquabus or Bluetooth interface is also available depending on the version of the farbwerk. The aquabus version of the farbwerk can be connected to an aquaero 5 or aquaero 6 controller. The aquaero can then be configured to control the outputs of the farbwerk or to transmit sensor data from the aquaero to the farbwerk to be processed by the farbwerk. Up to two farbwerk controllers can be connected to an aquaero 5/6 simultaneously. As a matter of course, this version can also be used as an USB device without aquabus connection. The Bluetooth version of ther farbwerk can have all outputs controlled via Bluetooth, additionally all sensor inputs are available via Bluetooth. This requires a Bluetooth device as well as an app. Aqua Computer currently supplies a basic Android demo app including source code that can be used to set the outputs of the farbwerk. Other mobile operationg systems are not supported! As a matter of course, this version can also be used as an USB device without Bluetooth connection. LED strips for 12 V, common anode. Suitable LED strips and connectors are available from Aqua Computer. ich kann also auch Temperatursensoren anschließen, richtig? Kann ich die Werte die der Sensor misst mir dann auch anzeigen lassen (in Zahlen) oder wird der nur für die Farbe der LEDs ausgewertet? Soweit ich weiß, können die Werte über die Aquasuite ausgelesen werden. Hallo, ich plane meine bisherige LED Steuerung zu ersetzen (NZXT HUE). Ist das Farbwerk zu Cablemod Widebeam Stripes Spannungstechnisch kompatibel? Hält der Controller die "letzten" Einstellungen über den Reboot hinaus? Die sind uns zwar nicht bekannt, aber die Einstellung wird gespeichert und die Spannung dürfte ja nicht viel größer sein als die herkömmlichen. Tut mir leid, diese Frage können wir nicht beantworten. Ich würde hier empfehlen sich an den Support von Aqua Computer direkt zu wenden, die können ihn diesbezüglich eine klare Antwort geben. Soweit uns bekannt, ist dies nicht möglich. Ich habe zwei Aurora LED Flexible Lights RGB und den Aurora LED Ring RGB von Alphacool installiert. Da man für jeden Steifen und den Ring bei Änderungen die Steuerung einzeln per Knopfdruck ändern muss, wäre meine Frage, ob das Farbwerk (mir den entsprechenden Verlängerungskabeln natürlich) diese Teile auch ansteuern kann. Sofern sie ein LED Verlängerungskabel verwenden, können sie die Flexlights auch über das Farbwerk steuern. Das ist kein Problem. Hallo, da dies die aquabus-Variante ist, brauchen Sie kein Bluetooth Modul in Ihrem Rechner. Es gibt noch eine andere Variante mit Bluetooth Modul, das wäre aber der Artikel 1011024.